According to co-director Deb Riehle, a total of 43 teams from all grade divisions attended this year's event, which serves as a qualifier for the state competition, which is set for April 6. Teams came from throughout Central and Eastern Oregon, from as far away as Fossil and Burns. Preparation for Battle of the Books begins months ahead of the actual competition as participants must become intimately familiar with 16 books. During competition teams score points based on correct answers from two categories: "In Which Book" and "Content." Sisters was represented in the grade 3-5 category by a team of fifth-graders, which included Olivia Nieto, Grace Fendall, Haven Heuberger and Norah Thorsett. "The Hatchets" as they dubbed themselves, qualified for Saturday's competition after surviving many rounds of battles with the 13 other teams made up of Sisters Elementary and Sisters Middle School students. Clare Nieto stepped in to coach them Saturday. The Sisters team in the grade 6-8 division comprised of Zoey Haney, Madison Haney, Kiara Martin, Layla Hicks, and Violette Kennedy made it to the semi-finals. They were coached by Angelique Haney. "We had great participation in our own school system," said Tiffany Tisdel, Riehle's co-coordinator. "It's heartening to have so many of our own students who choose to take part in this competition. It's amazing that the elementary alone had 10 teams and that it is all done through teachers volunteering and kids giving up lunch time and recess time to do it all." Tisdel continued, "I am so proud of our staff and students who put in a very long day Saturday. It takes a tremendous amount of effort on the part of our staff, parents and students to host this event. Everyone stepped up in a huge way." Tisdel felt especially thankful for all of the students who gave up their Saturday. "This generation of kids that we often hear of as inactive, un-motivated, video-gaming individuals worked enthusiastically together all day, taking on any role asked that was needed," she said. "It makes me proud to be an Outlaw and a part of this school community!" Riehle felt overwhelmed by the generosity of the community as well. "Angeline's Bakery, Melvin's Newport Avenue Market, and Sisters Coffee provided refreshments for our many volunteers, and Kerry Prosser organized it all for us as well as serving as a shepherd for any wayward volunteers who needed direction." "Paige Bentley of Sisters Public Library provided gift bags and goodies for the winners and Becky Aylor was a miracle worker in operating the concessions, providing signage and even stepping in as a moderator when we need one," she said. 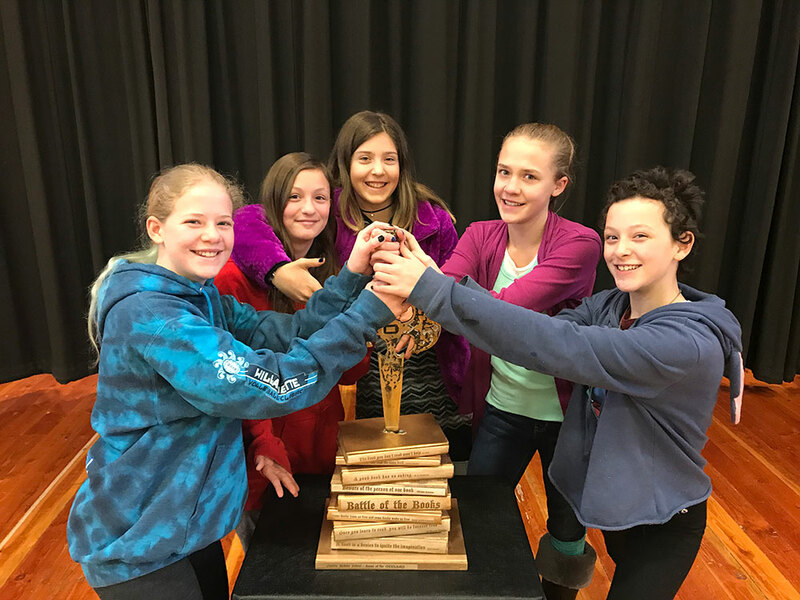 Miller Elementary of Bend won the grade 3-5 title, Seven Peaks, also of Bend, took top honors for grade 6-8 and Mountain View captured first among high school teams.